HFG is making significant contributions to meet a growing demand for health systems research. 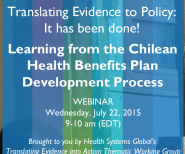 Funders need evidence linking health system strengthening investments to health outcomes. Practitioners seek universally accepted indicators to measure and monitor country progress. Both want to understand the key characteristics of successful health system interventions. Health Systems Research. 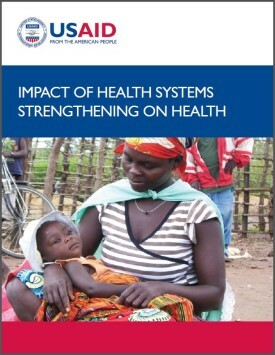 In June 2015, HFG published the Impact of Health Systems Strengthening on Health report, which for the first time presents a significant body of evidence linking health systems strengthening interventions to measurable impacts on health outcomes. 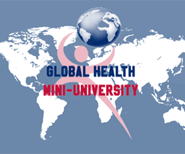 HFG has supported Health Systems Global, a network of researchers, advocates, and implementers whose aim is to strengthen the field, improve the evidence base, and promote the use of that evidence. In partnership with local and regional institutions, HFG has worked to build local capacity in health systems research and apply findings to policy dialogues at the national level. A discrete choice experiment (DCE) undertaken in Bangladesh provided insights into factors influencing the demand for maternal and child health care. Implementation Research. 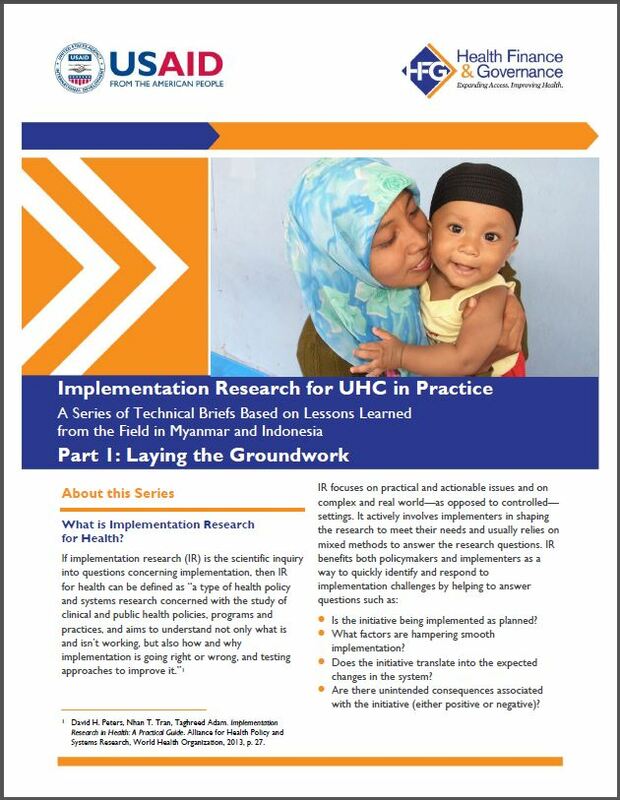 The project is synthesizing its experience conducting implementation research through Implementation Research for UHC in Practice–A Series of Technical Briefs Based on Lessons Learned from the Field in Myanmar and Indonesia. 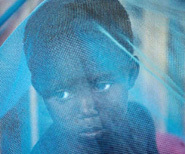 Health Systems Assessments. 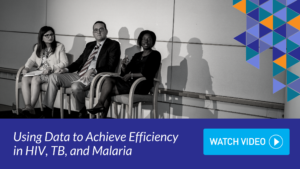 USAID’s Health System Assessment Approach (HSAA), developed first in 2007, has been widely used in the developing world to diagnose health systems performance and to capture system-wide information to better inform health sector planning. 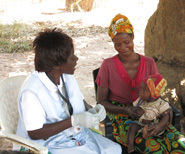 The HSAA looks at the entire health system, including governance, health financing, health services delivery, human resources, pharmaceutical management, and health information systems, plus the private sector, which is an important yet often overlooked part of the health system. 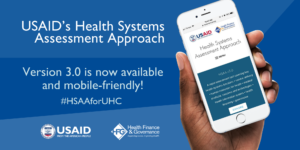 In 2017, working with USAID’s Office of Health Systems the World Health Organization, and other industry experts, HFG released the HSAA: A How-To Manual Version 3.0, which integrated technical updates from subject experts, guidance on assessing the the health system’s ability to effectively undertake core functions to achieve UHC and techniques to reinforce ‘systems thinking’. The HSAA 3.0 is now also offered through a web-based interface for use on mobile devices. Check out the latest version of the HSAA, now on an interactive web-based platform!